I love creating with MJ's TechnoStamper Sketch Challenges. I had my card all created and ready to post, I went back and looked at the sketch, good thing I did, as I created a card using next weeks sketch! Well, at least I'll be on top of my game for next week! This weeks sketch is one of those I'll turn to again for a jumping point. I rotated the sketch, dropped the sentiment and added some Faux Brads in it's place, and enlarged my middle panel. Okay, so I more or less altered MJ's sketch, but I was inspired by the original sketch. 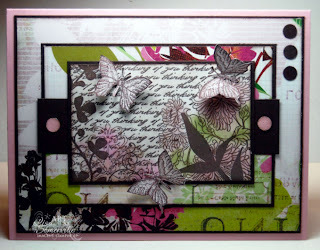 For my focal image I stamped Stampin' Up! 's Fresh Cuts in Chocolate Chip on White card stock. Then used the Burnishing Technique to add color to the image. I went over th e colored images with a Gel Pen, then added the stamped butterflies from Dreams Du Jour with Glue dots. Very nice, Lisa. What did you use for your background paper. I love these papers! This is probably the most beautiful card I have ever seen with this set. Great job. And you are already ready for next week--you rock! (even if it was an accident.) Thanks so much for playing along Lisa. I think I missed you on the re-cap last night. I will check. Well, your card is definitely inspiring it is gorgeous!!! Beautiful Lisa! 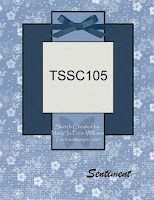 I love this stamp and you put it all together beautifully! TFS! Your card is stunning! Love all the details and colors. Fabulous work.